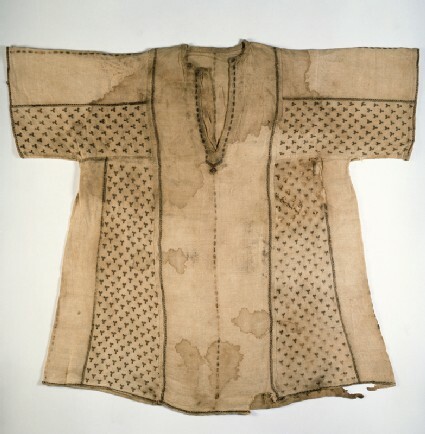 In the Mamluk period (1260-1517) embroidery was used to decorate personal garments - including tunics, trousers, kerchiefs, and caps - and furnishings. The decorative repertoire ranged from geometric patterns, often in the form of repeated single units, to arabesque designs, and auspicious inscriptions. Figurative motifs and heraldic designs were also used. The small size of this tunic indicates that it was probably made for a child, although the style is the same as those worn by adults. Generally wider than they were long, these garments have slit necks, and the individual parts were joined by ‘run and fell’ seams. This kind of manufacture marked a major change from the way similar clothes had been produced in Coptic Egypt. Wide bands of small Y-shapes alternate with plain fabric; the neckline, the top of the sleeves, and the front and back vertical centre have an additional line of embroidery with very small diamond shapes. At the base of the neck opening is a diamond-shaped medallion. A complete child's tunic, radiocarbon dated to 1390 +/- 45. The length given as measurement corresponds to the height of the garment, width to sleeve end to sleeve end. Tunics worn by infants and children were miniature versions of adult ones. More of these small ones have survived than adult-sized ones; the explanation may be that dealers only retained the embroidered parts of larger tunics. The garments are very wide in shape and measure more across from cuff to cuff than from the back of the neck to the lower hem. Like this one they have slit necks, wide sleeves and are made up of pieces joined by run and fell seams. 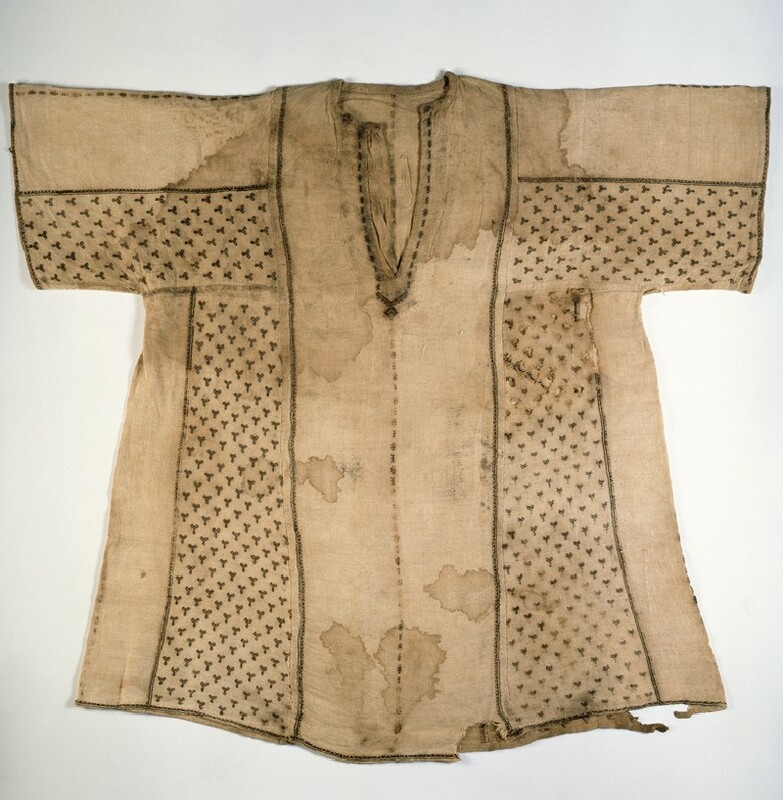 This is a radical change of style and manufacture from earlier 'Coptic' tunics that were woven in one piece from sleeve cuff to cuff on wide looms and decorated with tapestry-woven ornament. Embroidery was employed to embellish the new style tunics constructed from narrow widths of cloth cut in straight simple pieces. The amount of embroidery varies. We find some with just two shoulder bands of pattern darning, others with long lines of narrow geometric pattern running in vertical and horizontal lines, and others, like this one, with panels filled with an all-over pattern of repeating motifs. Here the tiny motif is Y shaped, but rosettes, fish and little birds also occur on these panels. The tunic has embroidery around the neck opening, ending with a little diamond-shaped medallion looking rather like a necklace. It is tempting to think this arrangement may be derived from the wearing of amulets and has a protective talismanic function. Life in medieval Egypt could be very uncertain and was constantly threatened by recurring outbreaks of plague and famine caused by the Nile failing to flood enough land.